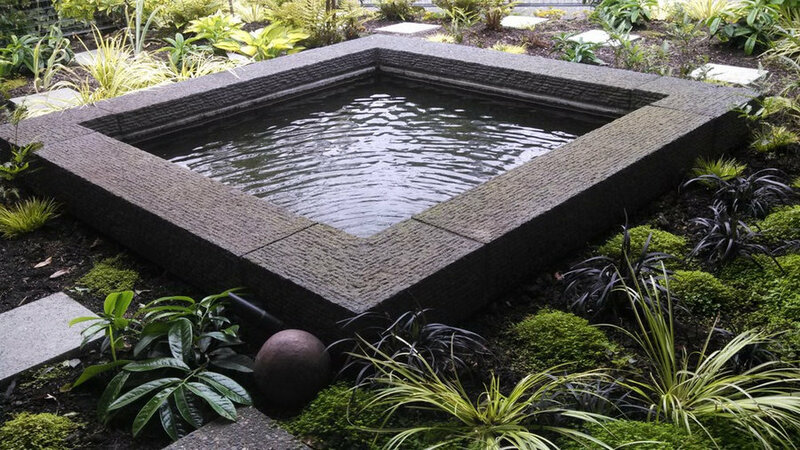 Our goal at Land2c Landscape Architecture is to design useful and beautiful landscapes. Enjoy this collection of additional pictures from projects. This is a small entry to mid-century modern home. The lovely square fountain pool was present. 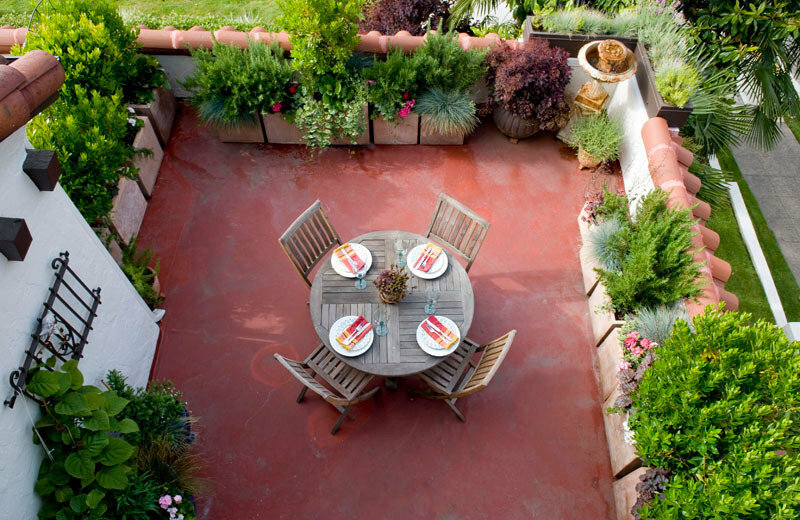 Land2c relandscaped the courtyard by adding more privacy from the street and low, lush plantings. 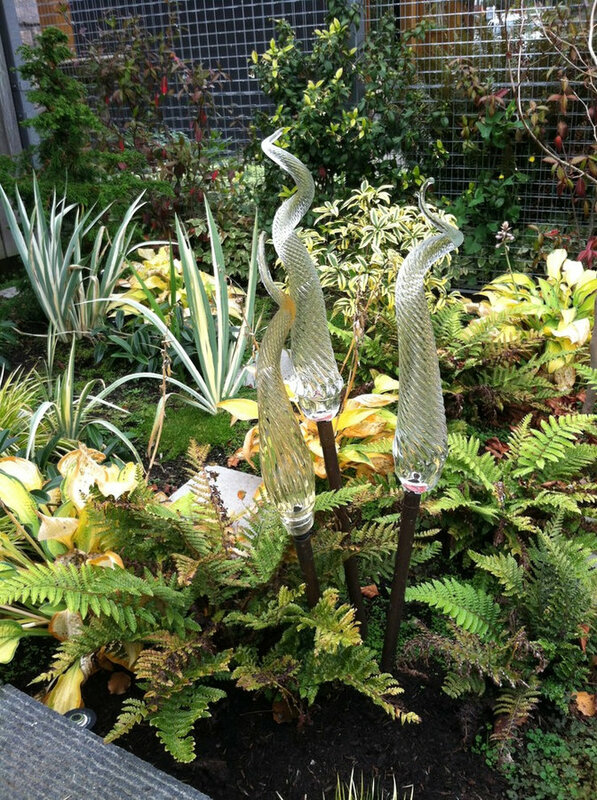 2' clear glass art is tucked into clusters of ferns and hostas in an entry courtyard. 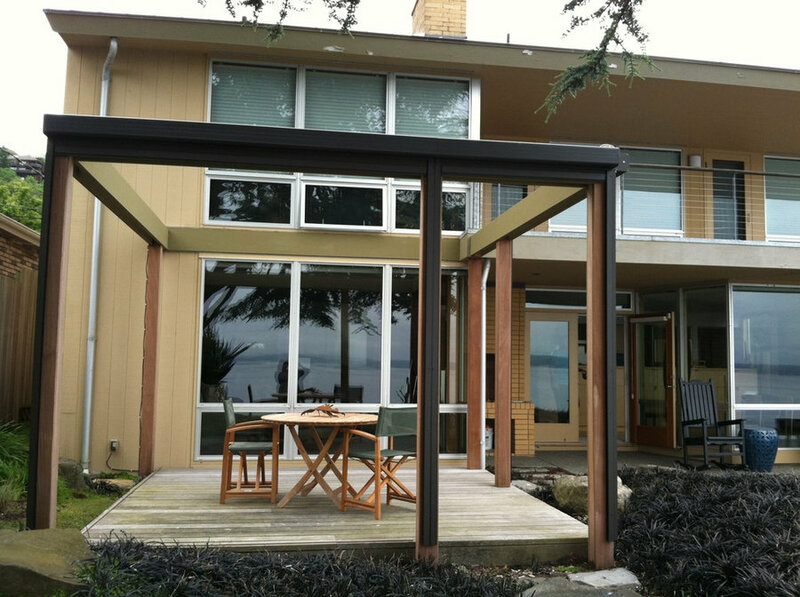 Mid-century modern waterfront home needed sun screen on western deck to make using the deck more enjoyable. 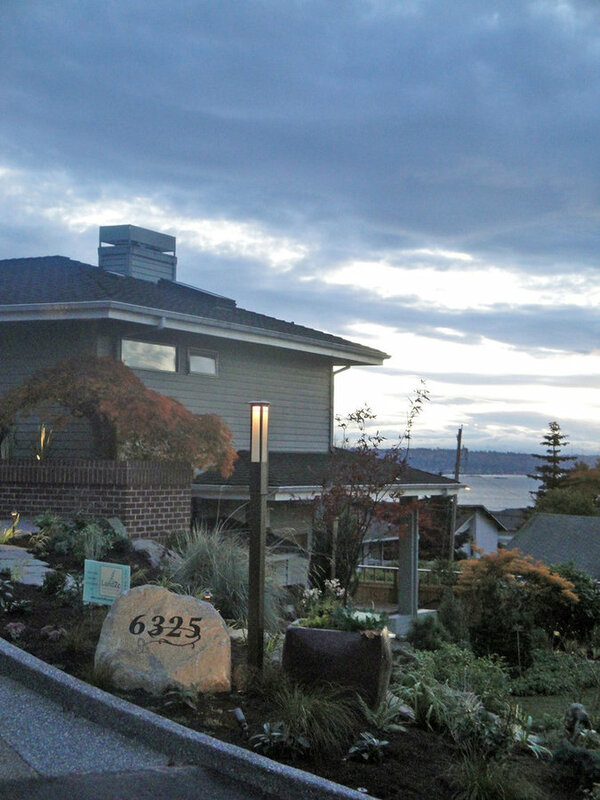 Land2c added the minimal arbor with push-button electric sun screen on two sides to blend well with the homes's architecture. Mid-century modern waterfront home needed sun screen on western deck to make using the deck more enjoyable. 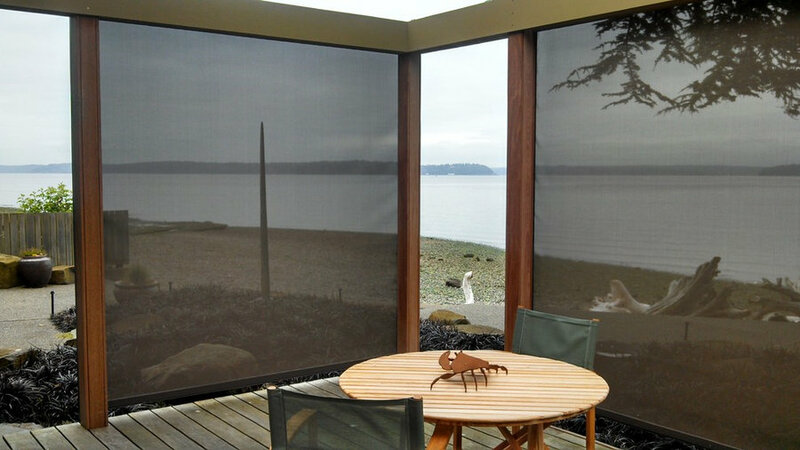 Land2c added the minimal arbor with push-button electric sun screening on two sides to blend well with the homes's architecture. The view remains clear, the sun is reduced, and outdoor sitting is now pleasant even in strong sunlight. This expansive condominium terrace needed privacy from an apartment building across the street to the right and the adjacent neighbor to the left. Light-weight fiber pots filled with varied heights of plants solved that problem. 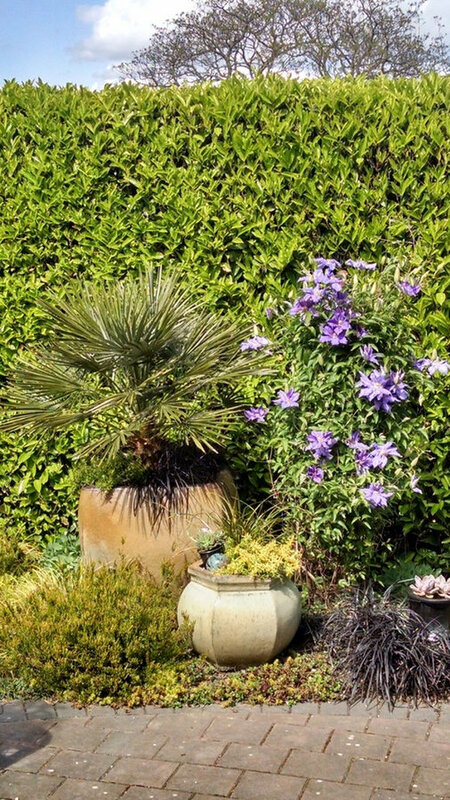 The area is now more private and welcoming with colorful Mediterranean-type plants. The tallest shrubs are compact Strawberry Trees (Arbutus unedo 'Compacta'. 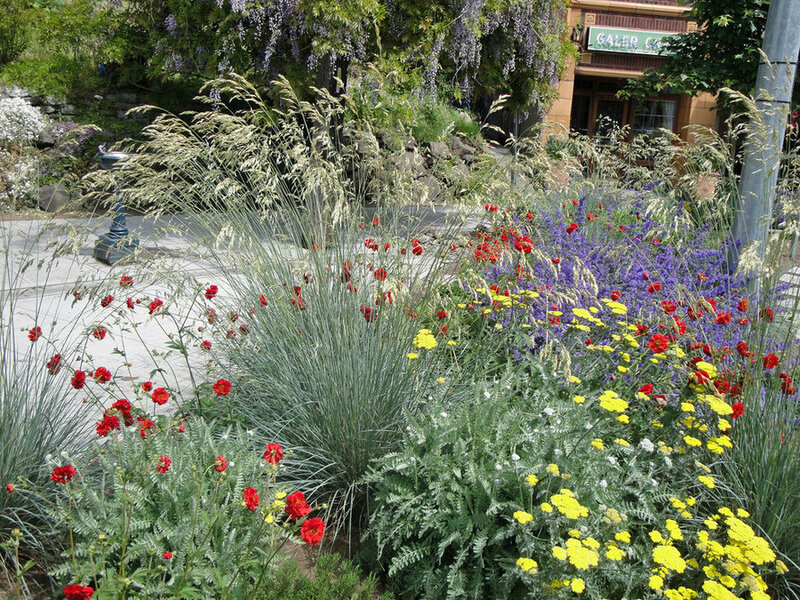 Land2c This project shows drought tolerant bright perennials on Queen Anne Avenue North. Blue Oat Grass, Moonshine Yarrow. Walker's Low Nepeta, red geum. 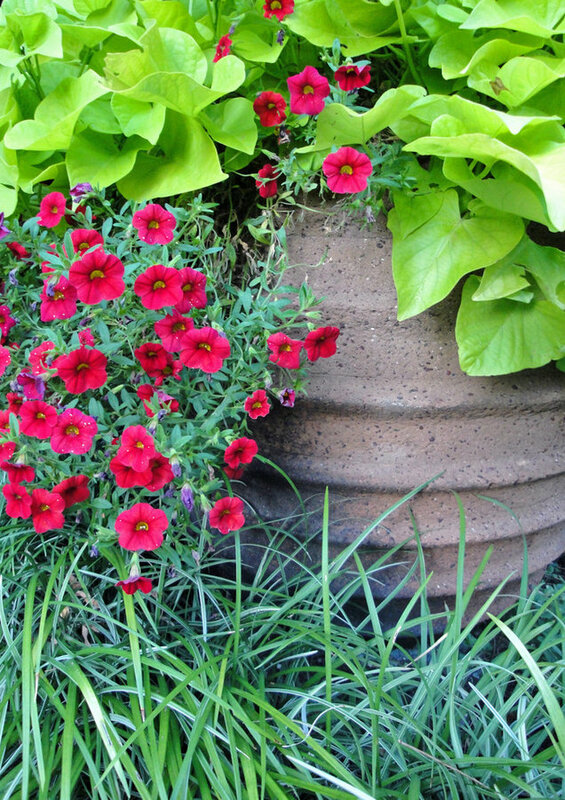 Large well- planted interesting pots provide interest and focal points in gardens. Appears 'old' to lend with stucco and tile-roofed home. 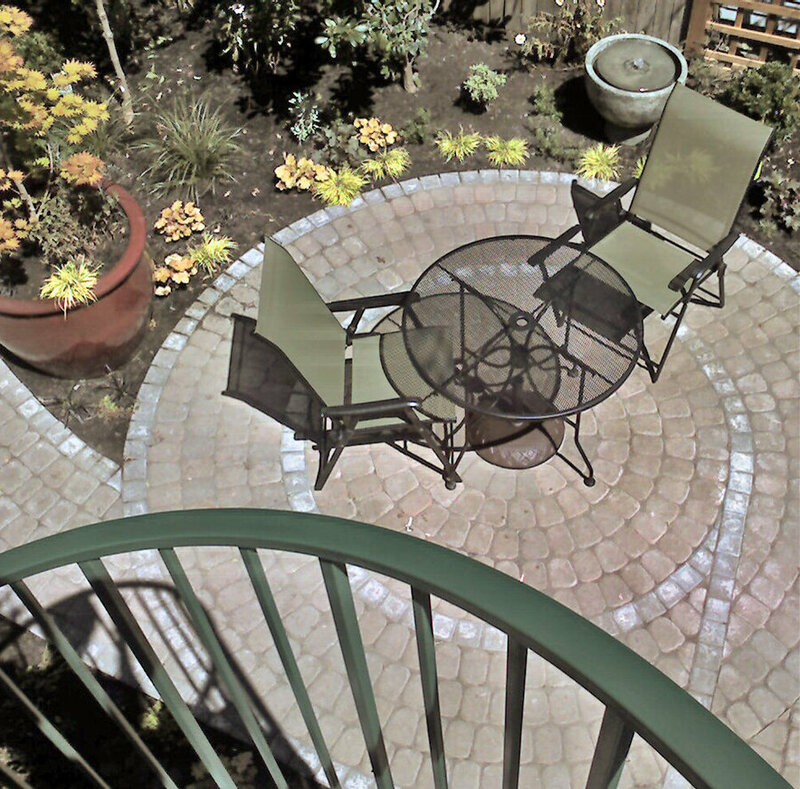 Newly planted usable landscape with circular-curved theme of pavers and spiral staircase for a narrow, rectangular garden entertainment space. The space is interesting when view from the main living area above and at patio level. The pot fountain baffle urban noise. 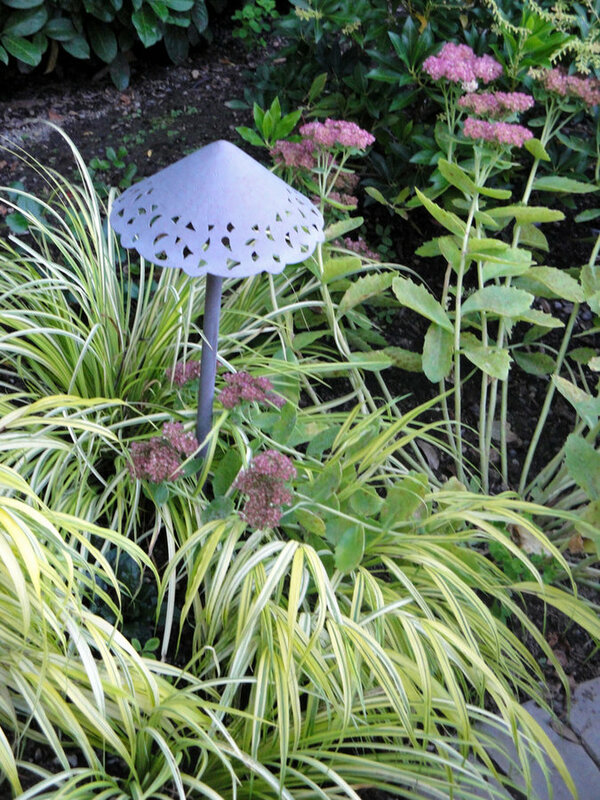 Land2c Bright variegation in plants keeps the shady garden bright and light. 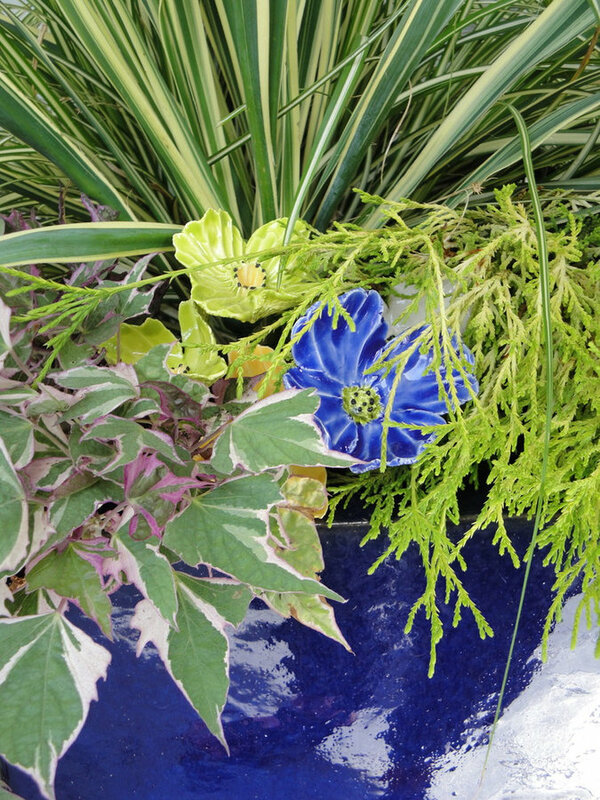 Blue accents add interest and color throughout the year. 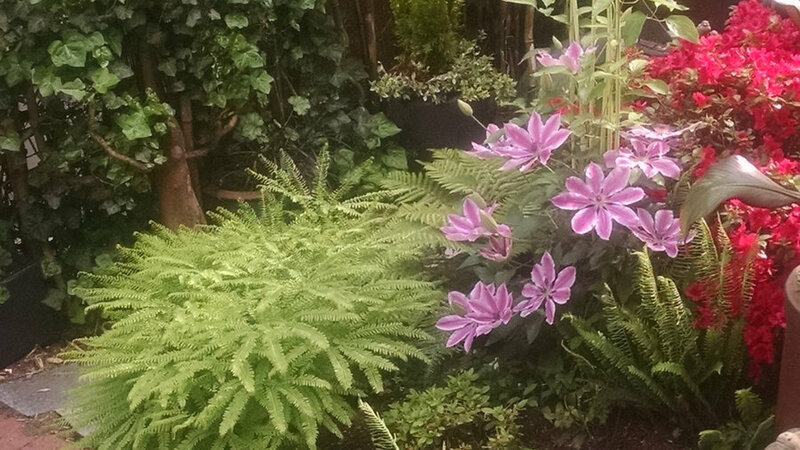 Land2c This container looks terrific throughout the year with its largely evergreen plants and vivid contrasting colors. Colorful art can act as no-maintenance 'flowers'. Land2c In May the Nelly Moser clematis winds up the green metal trellis. At the base is a very mature maidenhair fern and an evergreen deer fern. A mature Hino-Crimson azalea adds evergreen beauty and contrasting leaf shape. Land2c A tricky curved and sloped driveway needed better guiding signage, lighting, and a prominent address. Backing out is now noticeably easier. Land2c Hedges provide excellent privacy but often need interesting materials and plantings in front of them. 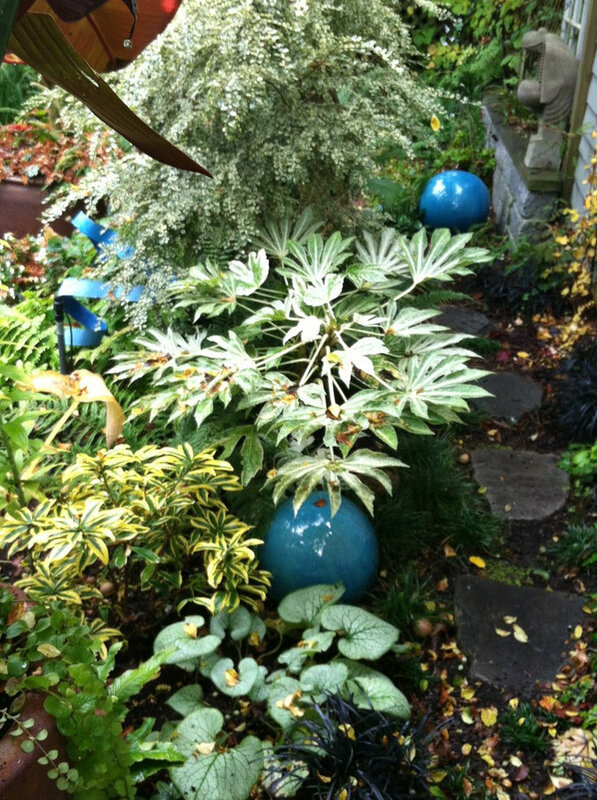 Well-chosen pots add height and interest. Land2c Simple charming elements in a closely viewed garden bed. 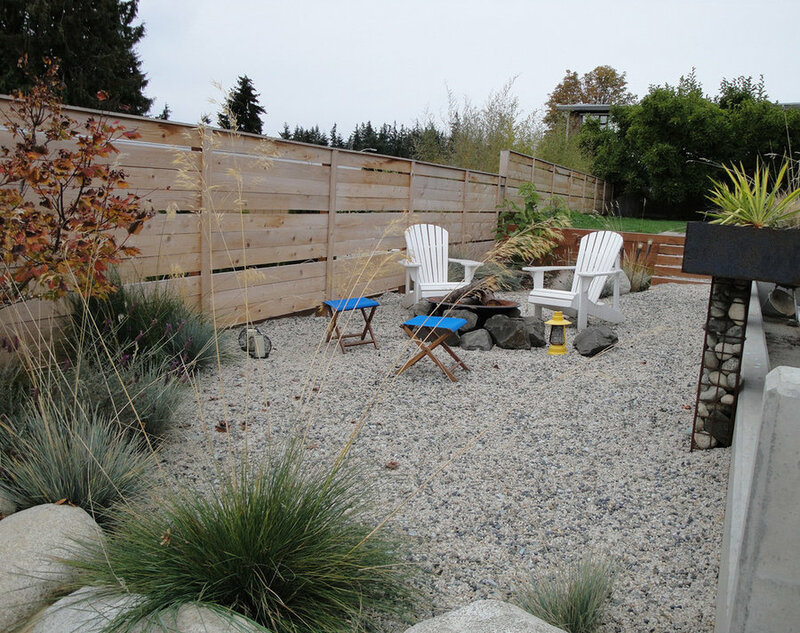 Land2c Green screen fencing and trellis on house with a custom entry door that repeats the entry pond's lines. Large planted cube pot adds interest to the front.